Synopsis: In the year 1971, San Francisco faces the terror of a maniac known as Scorpio- who snipes at innocent victims and demands ransom through notes left at the scene of the crime. Inspector Harry Callahan (known as Dirty Harry by his peers through his reputation handling of homicidal cases) is assigned to the case along with his newest partner Inspector Chico Gonzalez to track down Scorpio and stop him. Using humiliation and cat and mouse type of games against Callahan, Scorpio is put to the test with the cop with a dirty attitude. 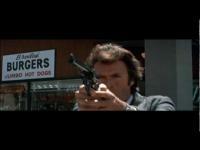 Tagline: Dirty Harry and the homicidal maniac. Harry"s the one with the label.